You might have noticed that some users on Twitter are able to change the font of their tweets. How do they do this? Are they sorcerers? As it turns out, they're not. They just know a few little Unicode secrets that allow them to seemingly make their tweet font bold, italic, or just completely different. The secret is quite simple. Unicode specifies a huge number of characters (over 100,000). So the characters that are on your keyboard are really only a very small fraction of the possible characters that can be rendered by most computers and devices. Amongst these 100k+ characters are alphabets, like the one on your keyboard, but bolder or more italic or 𝒸𝓊𝓇𝓈𝒾𝓋𝑒-er or with different ｃｈａｒａｃｔｅｒ ｓｐａｃｉｎｇ or 𝖒𝖊𝖉𝖎𝖊𝖛𝖆𝖑. 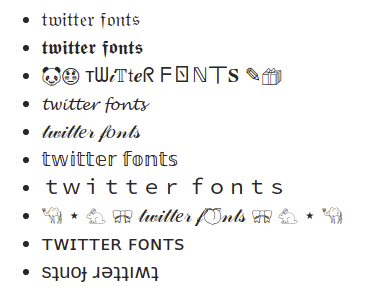 There are a huge variety of fonts that you can use on twitter - these are only the beginning of what Unicode grants us. Simply type your normal Tweet text in the first box and the generator will convert it into a bunch of different fonts which you can copy and paste into your Tweets, or in your Twitter bio, and just about anywhere else on the internet.